The Church of the Annunciation is near the Trapani Gate. It was built by Frederick of Aragon in the 14th century with a defensive purpose as you can see from its massive look and the decorative battlements. From the three-storied quadrangular bell tower, with single lancet windows on the first floor and double lancet windows in the others, you could control the gulf below. The outside was modified many times and just two doors are still in the original style. The wonderful rose window is now hidden partially by a Gothic porch added one century later. The neo-Gothic interior with a nave and two side aisles is characterised by pillars supported by cross vaults. In the side aisles there are many chapels built in different periods. Municipal Museum "Antonio Cordici" - Located in the interior of the Town Hall in Umberto I square, the Museum keeps archaeological finds, statues and paintings. The Antonello Gagini’s sculptural group of the Annunciation (1525) and a small marble head of Venus Ericina deserve particular attention. The street in front of the museum, Via Cordici, reaches San Domenico square which is bounded by the homonymous street and beautiful buildings. Venus Castle - In the southeasterly area of a Mount Erice with a beautiful view over the sea and the plain below there is the castle of Venus whose actual look dates back to the Norman period. However its history started a lot of time before when Aeneas built in this place a temple for his mother Venus. Since then the cult of Venus Ericina spread throughout the Mediterranean. 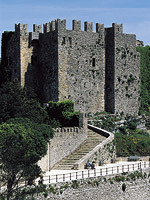 During the Norman period on the ruins of the temple with its same stones was built a fortress surrounded with imposing walls and protected by the Balio Towers connected to the castle by a drawbridge. The drain on the main gate enriched by the coat of arms of Charles V of Spain and by a wonderful double lancet window confirms its defensive character. Balio Garden - The Balio Garden surround the Venus Castle and the Balio towers built in the Norman period to defend the castle. The name of the towers and the garden comes from the Norman governor's name, the so-called the "bajuolo", who lived there. The outlook both towards Mount Cofano and towards Trapani and the Egadi’s islands is wonderful. Elymian-Punic Walls - The imposing Elymian walls (8th – 6th century BC) followed the northeast side of town, the only one exposed to possible attacks. Afterwards some smaller blocks were added to the oldest big blocks of the lower part of the wall to raise the wall. There were sighting towers, a very narrow communication trench with steep staircases and small openings for the passage of people and perhaps supplies. The only part o the walls in a good state is the one along Via dell'Addolorata from Carmine Gate to the Sword Gate. The Church of St. Orsola - Built in 1413, the Church of St. Orsola still keeps in the main nave the original structure with ribbed cross vaults. The Mysteries, sculptural groups of the 18th century, are carried on shoulder during the Good Friday procession. You can use the cableway to go to Erice from Trapani.